Update: .Net ended up posting my comments. Here’s the link if you’re interested; I’m one of many responses. I figured I’d head this post with a photo of my most recent home office inspiration. 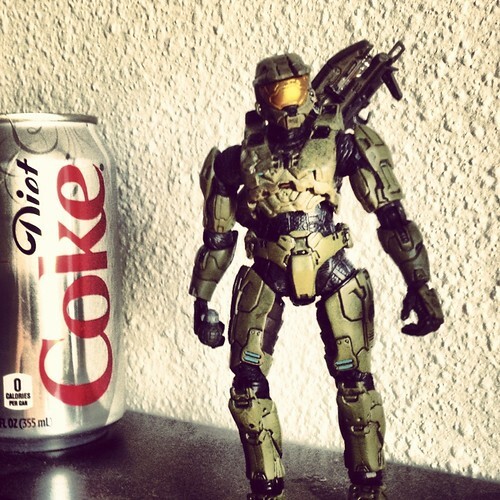 Master Chief rocks. I need to write about Halo sometime. Nerdcore. Anyways, I recently put together a little opinion about the place of project management in the web world and sent it in to a magazine. I don’t know if it will get published, but I’ll post it here as well. Hope it’s at least entertaining. I wrote it while sitting in Dulles trying to recover from a crazy day. Project managers often cause more harm than good. I work independently as a freelance project manager for exactly that reason. I think project managers tend to take roles that they shouldn’t for multiple reasons, the project is dragging, team leads are unavailable, budget is running out, you name it. The pressure to control variables that destroy projects can turn them into power-sucking monsters. I’m hearing Harvey Dent right now, “You either die a hero or live long enough to see yourself become the villain”. A wise friend once summed up an experience by saying that as a PM if a project fails, it’s his fault; if it succeeds it’s the team’s success. Sometimes that means as project managers we have to be “the hero that [the team] deserves, but not the one [they] need right now”. I hope you’re catching all of the super hero references. PM’s should be exactly that, super heroes. At SuperFriendly we’ve structured project management to defeat apathy and the forces of evil. Conventional project management puts up barriers, resists non-conformity, and strains the creative process. I think almost every designer can relate to the swoop and poop. A PM swoops in, tosses out several minutes of earth shattering changes or constraints, then flies off to some meeting. The project team has clean up the mess and carry on. This tends to happen when dollars are king and PMs are inept at controlling and foreseeing problems. There is an ever present pressure to supply a service or product for the most amount of money in the least amount of time. The result is usually mediocrity. What a team really needs is the project’s ultimate advocate. I put the project first and I don’t BS anyone. I make it very clear to all stakeholders that I advocate each project I put my name to. I have what feels like a million little things I do to keep that a reality, but it can be boiled down to several simple principles. Fight for quality, stand up for the team, tell the truth, and put on my cape–being willing to pay the ultimate price to save the project. Living by this code keeps me from manipulating, shifting blame, caving for extra margin, failing to plan, or being a miserable person to work with. I facilitate, I don’t mandate. I converse, I don’t coerce. I hope for the best and plan for the worst. Take one of my recent projects for example. The client needed a ton of work but we knew they wouldn’t be keen on how much it would cost. I spent two weeks building their trust in my team, drawing up schedules and deliverables, and figuring pricing to make sure I’d hit a margin. I made it clear to the client that I wouldn’t bid to their budget and told them the exact truth about what we could do and why they needed us. We won the job. Since then we’ve kicked off, pivoted for their needs, planned to our strengths, told them the difficult truths about their current performance, and made extra trips to visit; all while we’ve maintained their trust and our ability to meet deadlines while augmenting the project to fit their exact needs. We’re not sticking them on details and we’re not cheapening our work. We’ve worked to facilitate their needs within the constraints that we set together. It doesn’t always happen this way, but when things do get ugly, clients know exactly where I stand: right beside the project, fighting to maintain success. Project management is rife with problems because the opportunity to be a bad human for the sake of earning some extra dollars is ever present. Ultimately, a PM needs to be a solid person. It’s not impossible, but it’s sometimes hard. My advice is to work hard, stand up for the project, and wear a cape (sometimes).